The Verbum Buenos Aires is located in the Almagro neighbourhood which is within close proximity of the Palermo neighbourhood. Below you can find out more about these options, observe course details and read the student reviews. Use the green button at the bottom of the page to book a course at Verbum Buenos Aires. School info: Large school with friendly atmosphere, small class sizes, located near the heart of the capital city of Buenos Aires. Situation: The school is located in the large capital city of Buenos Aires, near the heart of the city's downtown district. The Verbum Buenos Aires is a language school with an especially warm and friendly atmosphere. The classrooms are all large and airy and are fully equipped with video and audio materials. There is free coffee and tea available to students and some study materials can be provided. The school offers a very flexible timetable permitting its students to choose the options that they feel will suit them the most. The class sizes are kept small with a maximum of 7 students per class and a minimum of just 3, the teachers feel that this is a much better method of teaching. Students can also learn on a one to one basis with a teacher if they prefer. There are several different courses taught at Verbum Buenos Aires including the very popular regular courses. These consist of 10 lessons per week with each one lasting for 55 minutes, the regular Spanish courses are offered at 6 different levels. The levels begin with the novice low, middle and high then intermediate low, middle and high and advanced low, middle and high they conclude with superior. 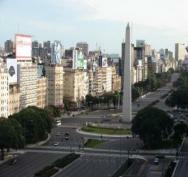 Description: The city of Buenos Aires is a delightful city to visit as it has such diversity. There are the busy shopping malls and historical monuments and the peace and tranquillity of the numerous parks and gardens throughout the city. The nightlife in Buenos Aires is vibrant and lively.